The recent discovery of Proxima b has not only excited much of the public, but also scores of scientists who are attempting to explain its many different aspects. At the time of writing, there are already 8 papers discussing a wide variety of topics concerning Proxima b: ranging from its potential habitability and the impact of flares, to how to characterise the planet’s atmosphere with NASA’s new James Webb Space Telescope. Whilst these pieces of work are important in looking at the present state of the planet, (well the state of the planet 4.25 years ago) one important question from its past needs to be answered. How did it form and evolve into the planet that is detected today? Knowing how and where it formed can give valuable insights into its composition and atmospheric properties, whilst understanding its evolution can give hints at to what else, if anything, should be expected to be discovered orbiting Proxima Centauri. But before we examine the specific case of Proxima b, it is useful to understand just what planets form from and how they do it in a very general case. Before a star system is born, the entirety of its material is held in a protostellar nebula in the form of gas and dust; this includes the parent star (composed of mostly hydrogen and helium), along with all of the planets, asteroids and dust particles (which are mostly heavy elements such as carbon, oxygen, etc). The nebula then collapses in on itself to form a protostar surrounded by a protoplanetary disc. This gas and dust disc then accretes on to the protostar over a period between 1 and 10 Myr, and this is the time and location that we expect planet formation to take place. The dust in the disc begins to settle to the middle of the disc, whilst simultaneously clumping together and coagulating into larger pebbles, and eventually into asteroid sized bodies. We call these bodies planetesimals. As they continue orbiting the star, they interact with other planetesimals – occasionally colliding and forming larger planetesimals – until they eventually become planetary-sized objects (what we call protoplanets) similar to the terrestrial planets today (Mercury, Venus, Earth, Mars). If these protoplanets can accrete enough material they may become massive enough to hold a substantial atmosphere and then grow into gas giants similar to Jupiter and Saturn. This all occurs during the lifetime of the protoplanetary disc, so that the only objects surviving once the disc has accreted on to the star are the star itself, any surviving planets, and all the remaining asteroids, pebbles and dust. Now this is a very general view of planet formation; what happens when we begin to examine the specific case of Proxima b? When looking at individual systems, there are many different scenarios that branch off of the general case described above. I will now explain these scenarios and their implications for the composition and structure of Proxima b, and also the multiplicity of the Proxima Centauri system – that is whether we should expect more planets to be discovered. Scenario (i) in situ planet formation: It is thought that the terrestrial planets in the Solar System formed near their current orbits from a group of smaller protoplanets embedded within swarms of even smaller planetesimals in a gas-free environment, after the end of the disc lifetime. When using this scenario to form Proxima b, it is assumed that enough solid material in the form of protoplanets and planetesimals has been able to form and migrate to the general location of Proxima b before the end of the disc lifetime. 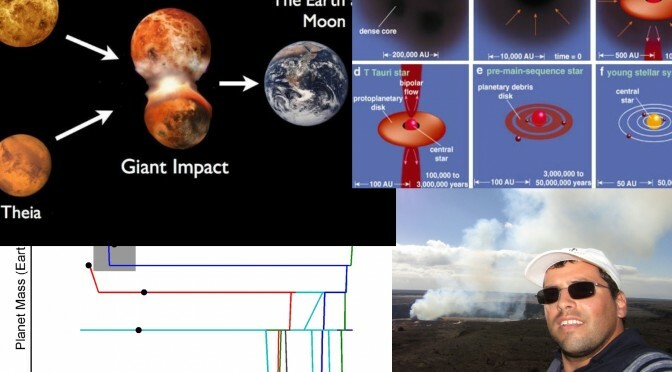 To then form Proxima b, the protoplanets and planetesimals undergo significant gravitational interactions with each other, resulting in numerous collisions, allowing the protoplanets to grow. Over a long period, typically a million years, the majority of the planetesimals and smaller protoplanets are accreted by the more massive protoplanets, leaving only a few protoplanets remaining. The initial mass contained in the reservoir of protoplanets and planetesimals, will determine the mass of the few remaining objects. Typically 2–3 of the survivors contain about 80–90% of the total mass, with the remaining mass in a number of much smaller objects. The important thing to note here is that with this scenario there are always multiple planets formed. This is important for Proxima b; if Proxima b formed through this method, and is the most massive of the survivors in its local area, then we should expect to find more planets orbiting Proxima Centauri in the future. When thinking about what kind of world Proxima b will be like if it formed this way (i.e. will it be a dry rocky planet or a water-rich ocean-world), we have to know what kind of material the planet formed from. With this scenario it formed from material that was located inside the snowline, so there will be little water or volatile material within its composition. The only way for water to get onto the planet is if it was transported into the planets local vicinity. If there was a massive object located out past the snowline, then it could scatter smaller asteroids and planetesimals into Proxima b’s vicinity, delivering water and other volatiles (similar to the Late Heavy Bombardment on Earth). If this did happen then Proxima b would still be predominantly rocky but would also contain a modest amount of water. Scenario (ii) Multiple migrating embryos: Where the scenario above took place in a gas free environment, this one looks at Proxima b forming during the gas disc lifetime. To form Proxima b during the gas disc lifetime, it is necessary to do so far from the star, at distances greater than 1 AU. Why do they need to form so far out? 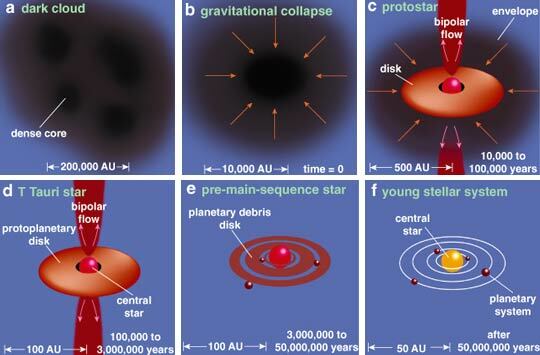 Planets embedded in protoplanetary discs are expected to undergo significant inward migration. This is due to the planet’s gravity slightly perturbing the gas in its local vicinity, exchanging orbital energy with it, and consequently changing its orbit. As these perturbations are not symmetrical (i.e. the outer disc perturbations are different in strength than the inner perturbations), this results in a net torque acting on the planet, forcing it to migrate either inward or outward. Normally, the gas exterior to the planet’s orbit tugs on the planet more than that interior to its orbit, resulting in the planet losing orbital energy. This is important as the time it takes for protoplanets to migrate all the way in close to the star is typically comparable or shorter than the disc lifetime. This is why it is not possible for Proxima b to form close to the star whilst the gas disc is around, it will migrate into Proxima Centauri and be engulfed, leaving no planet. To form Proxima b at the same time as the gas disc is accreting on to the star, it has to form far from the star in the outer disc. To do this, we assume that initially a number of smaller protoplanets have been able to form far out in the disc (with semi-major axes greater than 1AU). As the gas disc evolves, these protoplanets migrate inwards and begin to interact with each other, occasionally colliding, forming more massive protoplanets. As the gas disc comes to the end of its lifetime, the remaining planets have now all migrated to the local vicinity that Proxima b is observed today. Typically only a handful of planets survive the migration and accretion process, as the less massive protoplanets have collided with the more massive ones. Similar to scenario (i), 2-3 of the surviving planets contain the majority of the mass in the system. These planets would be comparable to Proxima b. A small number of less massive planets would also be found in the vicinity. Now this outcome seems very similar to the one found above in scenario (i), so how can we tell the difference? Both scenarios state that there should be more planets orbiting Proxima Centauri. But what about the water content? 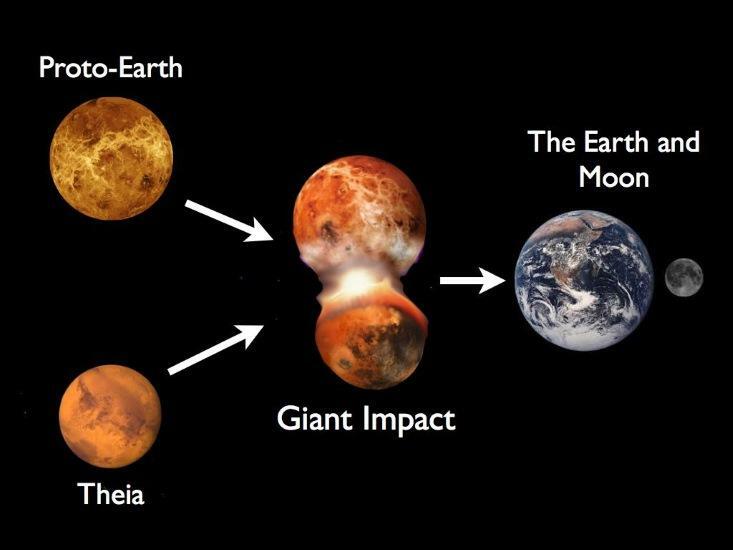 In scenario (i), all the planets formed inside the snowline, so they should be dry, but in this scenario, the planets formed far outside of the snowline. This would result in them containing large amounts of water and volatiles, and as the planets migrate interior to the snowline, they have enough gravity to hold on to it. So here Proxima b would be extremely water- and volatile-rich, and could represent an ocean world, one of many in the Proxima Centauri system. Figure 3: The evolution of multiple protoplanets (black dots) migrating in to form Proxima b. Planets inside the grey region are analogous to a Proxima b analogue. Proxima b is represented by the black cross. Scenario (iii) Formation as a single planet: This scenario is similar to scenario (ii). It again attempts to form Proxima b during the gas disc lifetime; but in this case only one protoplanet, a young Proxima b if you like, is used. This protoplanet is surrounded by swarms of planetesimals and/or pebbles, and as it migrates inwards towards the star, is able to accrete any planetesimals or pebbles it collides with. Over the gas disc lifetime, the protoplanet is able to migrate all the way in towards the star, and depending on the amount of planetesimals/pebbles it accretes, its mass can be as small as Mars (0.1 Earth masses) or as massive as a super-Earth (3–10 Earth Masses). It can also have a similar mass to the observed Proxima b (~1.3 Earth masses). When this scenario produces a planet comparable to Proxima b, it is always alone. Since the planet migrated from the outer disc, outside the snowline, any planet similar to Proxima b would be abundant in water and volatile material. It would again be an ocean-world, but in contrast to scenario (ii) it would be the lone planet around Proxima Centauri. If future observations showed that Proxima b does indeed have a significant amount of water and volatile material, and has no sibling planets, this scenario would be supported as a viable formation history for the planet. Editorial note. 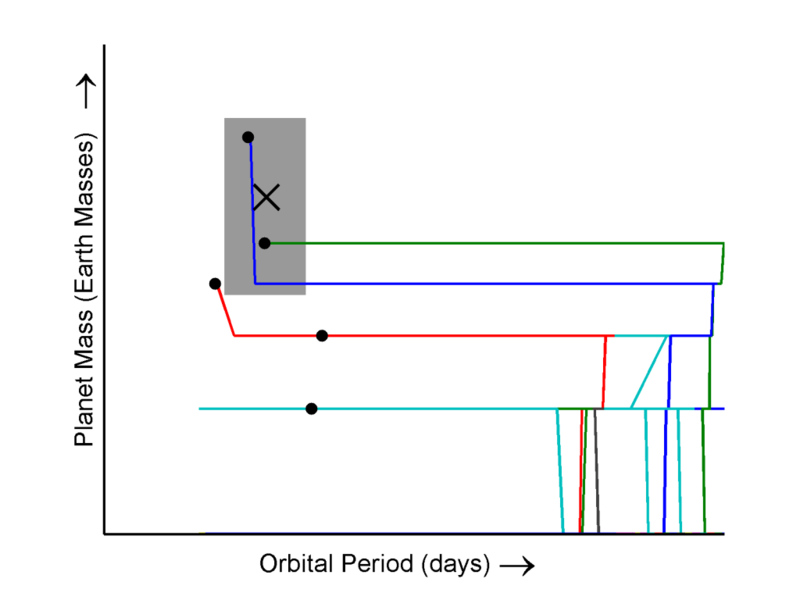 This is an outreach article based on the scientific report “Exploring plausible formation scenarios for the planet candidate orbiting Proxima Centauri”, http://adsabs.harvard.edu/abs/2016arXiv160806908C. About the Author. Gavin Coleman is a post-doctoral researcher at Queen Mary University of London (UK). 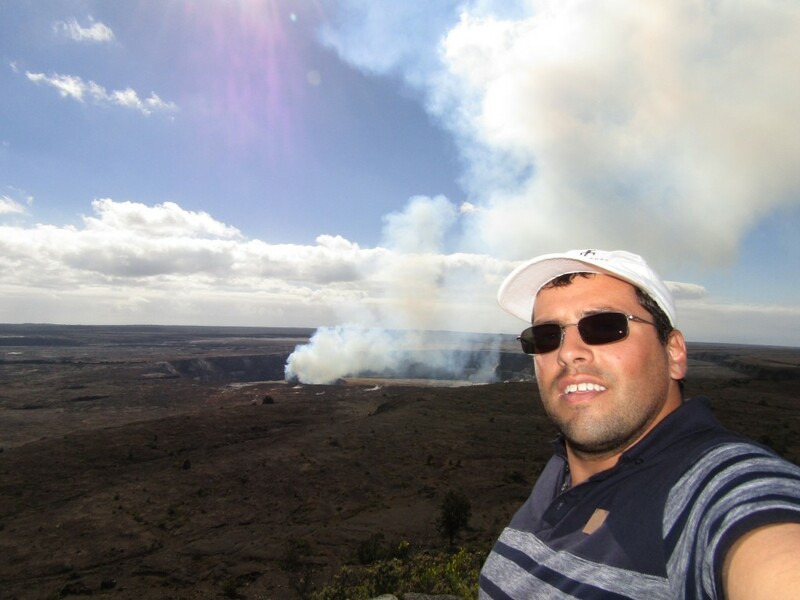 He recently finished his PhD examining the formation of planetary systems, and focusing on the numerous factors that influence the diversity in their architectures. He is member of the Pale Red Dot collaboration and an active editor of this blog.